The Cerro Rico, which translates to Rich Mountain. Don Juan in his street clothes and his work clothes. Members of Los Malditos cooperative changing for their work day. Headquarters of the Kory Mayu Cooperative, on the Cerro Rico. Don Octavio and his family live at the mine mouth. 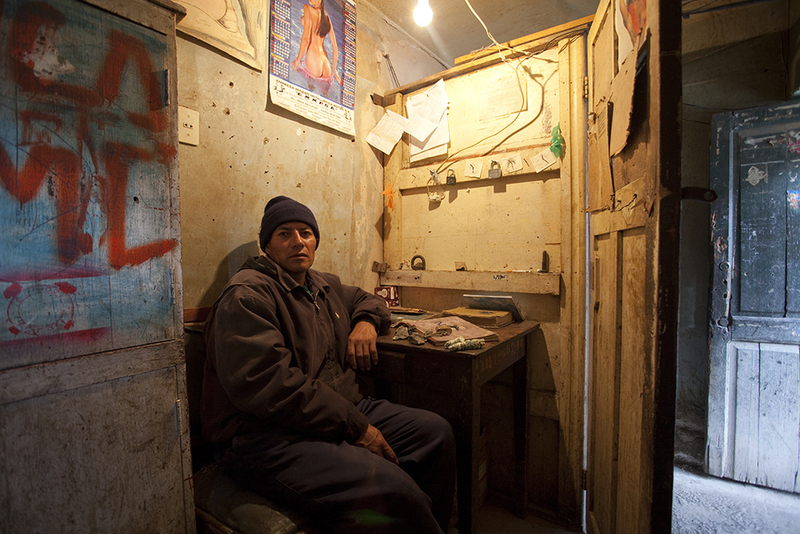 His wife, Dona Nieves, works as a guard for the cooperative. 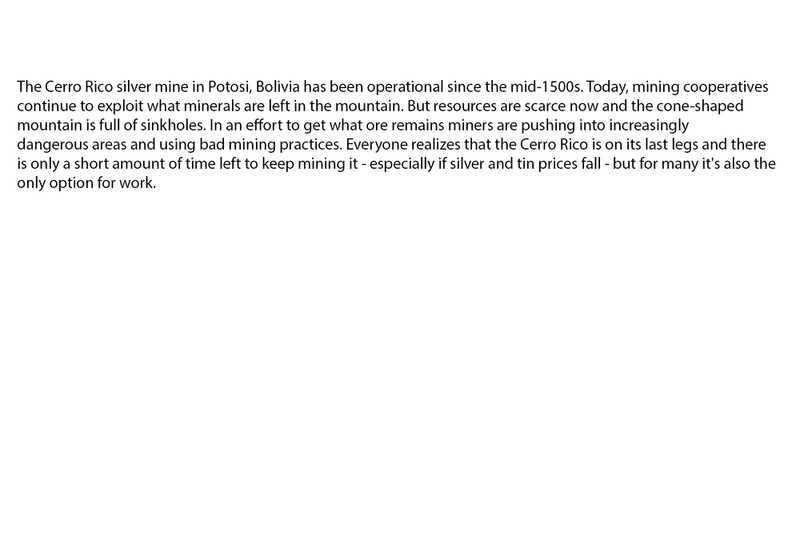 Don Pablo has a large mine he works with his sons' help, but much of the good ore was already extracted decades ago. A young boy on his first day working in the mine. Don Adrian working his ore as his assistant prepares explosives. Sometimes the men stay in the mine after their shift, to hang out and drink. They say, This is where we get our livelihood. Up there, it is different. 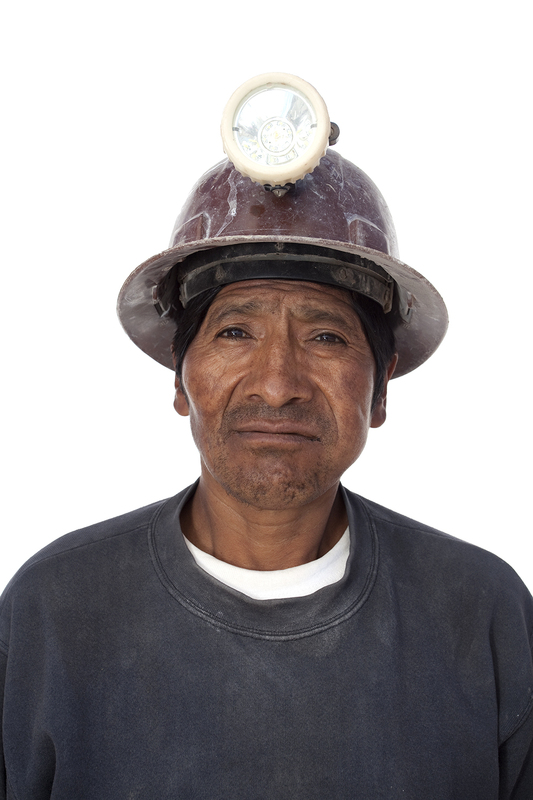 Don Carlos stopped working in the mines after an accident that killed his closest friends. Now he guards the State's defunct mill. 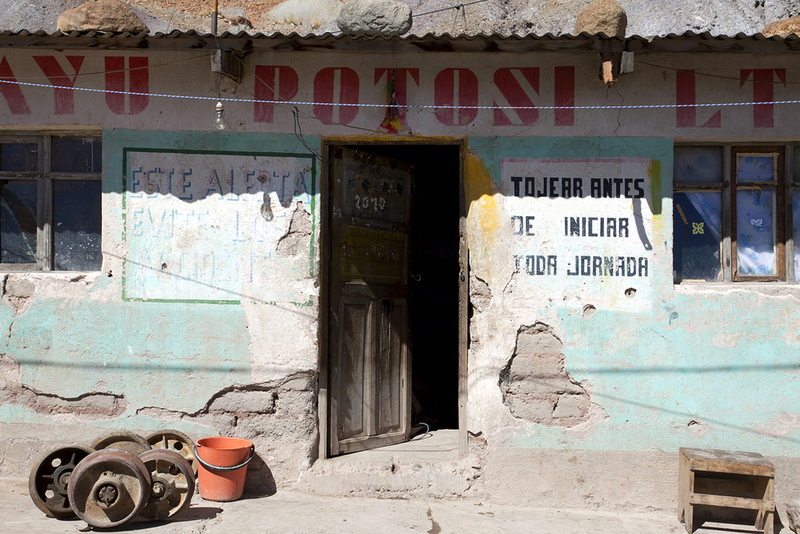 An office at one of the bigger mineral processing mills in Potosi. Don Adrian with the head of a smoking devil his teenaged son made for him. It's for good luck and protection. Some things miners use for luck and protection. From left, clockwise: coca leaves, liver, milk, oil, orange, alcohol, symbolic charms. Mineral inside the mine is transported from level to level using large rubber bags and a pulley, often manually operated. A chemist tests ore for purity and calculates what the company purchasing ore from cooperatives owes them. The men sometimes wait around for hours to get paid. The bosses usually provide beer. 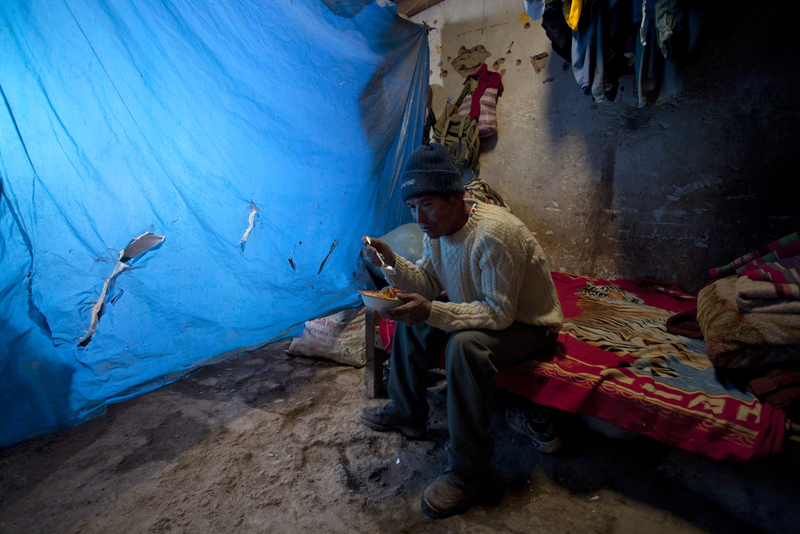 Many of the workers go to the so-called Miners' Bar once they receive their pay. Unlike many, El Mono, has the option of leaving the mine to work in tourism, but he says he likes the quick money and camaraderie. The cooperative members toasting together after electing new leadership and blessing a new building at the mine mouth. The Cerro Rico is divided among cooperatives. Each cooperative, in turn, has various groups. Each group keeps its minerals separately. Miners sacrifice llamas at the mine mouth, appealing for both safety and luck in their work. Llama blood is thrown on the mine entrance and over the doors of buildings. Women are considered bad luck for mining and are rarely seen at the mine. The exception is the day of the llama sacrifices, when they celebrate with the men. After killing the llamas, the men break down the animals. The more llamas you can afford for the sacrifice, the better your chances in the mine. The women cook the llama meat without any spices or salt. Salt is considered bad luck. The miners' most important gear. From left, clockwise: steel-toed rain boots, a lamp, helmet, coca leaves. One year after an accident killed a young miner, his family and friends gathered to celebrate his ascending to heaven. The cemetery has a miners' section, though not all miners are buried there. A selection of miners' columbarium details.